Like most professional photographic organisations, The BPPA has a strange relationship with photographic education. On one hand many of our members visit courses on a regular basis and quite a few fill roles as members of industrial liaison groups. On the other hand we find it impossible to whole-heartedly recommend more than one or two courses anywhere in the country. We readily acknowledge that there are many lecturers and tutors that try hard to prepare their students for entry to the profession but it appears that there are relatively few that come close to succeeding. Professional photographers talk about this topic a lot – mostly bemoaning the state of photographic education and even when it is pointed out to them that not all those studying photography want to become photographers they are still highly critical of the status quo. Anecdotes about students who don’t know their “apertures from their elbows” abound and entire cohorts are dismissed because of this. Many courses aren’t concerned with training for the craft of photography but it isn’t always clear that the undergraduates signed up for those courses realise this. Members of The Board of our association have become quite disillusioned by the long-running trend towards “academisation” or “academic drift” even within courses whose principle purpose is to produce graduates capable of working in the photographic industry. The world of academe understands intellectualisation and it understands research based methodologies. It doesn’t understand or, more importantly, respect craft, skill or talent. What we are scared of is a pecking order of tutors, lecturers and professors developing where those who talk intellectual nonsense about photography using terminology compatible with the way that higher education perpetuates itself are placed at the top and those whose goal is to equip students with real world skills are looked down upon or relegated to support roles. We know that photography – and press photography in particular – has a vocabulary all of its own with liberal usage of slang, acronyms and technical jargon but the way that academics use language is either intentionally or unintentionally excluding the profession from taking an active part in education. If you’ve never watched the US sitcom “The Big Bang Theory” you’ve missed out on one of the best bits of television to come out of America in many years. It also serves as a good analogy for what is happening to arts education in general and to photographic education specifically. At the top of the tree we find Dr Sheldon Cooper – a theoretical physicist whose intellectual arrogance allows him to look down on all other areas of research and education. Next on the ladder we have Dr Rajesh Koothrappali – another theoretical physicist whose work is less well respected and nowhere near as trendy. Moving down the list we have an experimental physicist Dr Leonard Hofstader who actually gets his hands dirty in the lab and Dr Am Farrah Fowler who is a neuroscientist. Getting nearer to the bottom of the tree we have Dr Bernadette Rostenkowski who has sold out and works in the real world in research with a large pharmaceutical corporation and poor old Howard Wolowitz who ‘only’ has an MA and is an engineer and an astronaut. There are several other characters including the pivotal non-scientist Penny but for the purposes of the comparison we have enough players. You could easily build a table with direct comparisons from the world of Big Bang Theory to the world of photographic education in the UK. At the top there are the Sheldons – thinkers who write papers, have big thoughts about the nature of photography but who, on the whole, don’t take real pictures – or at least ones that matter. There are the Leonards – practitioners who cannot make a living outside of academe who occasionally have something interesting to contribute to the bigger picture and there are the Howards that actually contribute something concrete but whose achievements don’t cut much ice within the education system. You can slot the other characters in for yourself. Everyone wants to look down on the Bernadettes – highly trained and highly qualified and actually earning a living from a real world application of those skills – but they prefer to ignore or dismiss them instead. A big mistake and a very silly and divisive attitude. I’m not going to stretch the analogy any further by shoehorning the other key characters into it but, if you are a Big Bang fan, that doesn’t mean that you can’t have a go. Unfortunately there is one problem with this comparison. The Big Bang Theory is really funny. Academic drift in UK photography education isn’t. There seems to be a tendency within arts education that exists to make sure that it continues to exist: a self-perpetuating and self-interested core whose sole purpose appears to be to create a world where the words spoken and written about the art are more important than the art itself. Good news of sorts – we are not alone. The concept of academic drift is well recognised and well documented. Dr Jonathan Harwood is Emeritus Professor of History of Science & Technology at the University of Manchester and he wrote a very interesting paper entitled “Understanding Academic Drift: On the Institutional Dynamics of Higher Technical and Professional Education” in which he identified a trend in higher education whereby knowledge which is intended to be useful gradually loses close ties to practice while becoming more tightly integrated with one or other body of scientific knowledge. One of his key conclusions was that as teachers search for status in the academic hierarchy there is a tendency to mimic colleagues with perceived (or actual) higher status and that choice of language (dense ‘academic’ jargon, etc) is one obvious way to achieve this. It is clear that this tendency to become part of the system has spread from Dr Harwood’s initial research areas of agriculture, engineering, medicine and management sciences in the 19th and 20th centuries into arts and photographic education in the 21st. Theoretical photography has grown and flourished inside the academic world whilst it appears that nobody from our industry was watching. 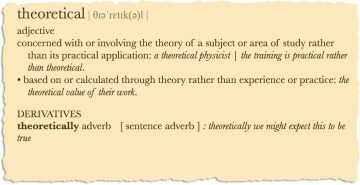 It employs a vocabulary so opaque that you have to study with the masters of the game to understand it and by then you are part of the game. You have become part of theoretical photography and if you dare to become the little boy who calls out the Emperor’s New Clothes as a sham then you are dismissed as not having sufficient intellectual capacity to ‘get it’. There are those who inhabit the arts establishment who are complicit in the game too and all of the time those of us who practice and love photography are being nudged out of what should be a series of inclusive discussions. This wouldn’t be too much of an issue if they went off to play their game and left us to get on with doing the job but there are two serious side effects that cannot be allowed to continue. The first is the effect on those young people spending a small fortune studying photography with the intention of making it their career. Many (or even most) of them are being taught by people with no real understanding of, or regard for, the industry and whose primary motivation is to further their own careers as academics. The second is the way that Government defers to academic opinion rather than that of professionals. In an industry like ours where practitioners are, by the very nature of the job, individuals it is so much easier to consult with a learned professor than it is to talk to photographers. All too often this results in a skewed view of what is happening, what needs to happen and how to get from one position to the other. Dialogue is almost certainly the answer but how do working photographers get inside the walls of academe to get it started and how do we persuade academics to put aside their opaque vocabulary? Could it be that we need intermediaries and interpreters? The answer might be that those lecturers inside the system who haven’t bought into the academic drift yet could act as a bridge. As an association whose mission is to promote and inspire the highest ethical, technical and creative standards from within our industry we would like to extend an invitation to meet, talk and see if we can do something to stop theoretical photography mimicking theoretical physics. Being David the decision was clear, but in the hinterland lay never-ending battles with the bureaucrats who had come to populate an education system predisposed to interfere, and who were determined to turn his jewel-in-the-crown vocational ‘docphot’ course at Newport into an academic course. An academic course would benefit few students wishing to become working photographers, the beneficiaries would be the administrators and an institute that had the degree status necessary to secure government funding. One suspects the language required to secure funding would be very different from the lucid, unambiguous vocabulary of photographic practice espoused by Hurn. “I believe that in a society in which every individual opinion counts, photography at its best has a unique ability to instruct; to help make alternatives intellectually and emotionally clear; to spotlight foolishness, to bring people together, to break down barriers of prejudice and ignorance and show ideals worth pursuing. We should trust the peculiarities of our medium. And if we are truly curious or fascinated or profoundly interested in our subjects then we are less tempted to interfere, to control, to change, to improve,” says David Hurn in On Being a Photographer. David resigned from Newport in 1990. By 1994 his influence had been all but swept away. Falmouth is one of those tiny number of courses that The BPPA would be happy to approve. Taught well by professionals. I am personally more than happy to act as a bridge. the BPPA are very welcome at any time to come to Falmouth Uni and chat to all the staff and, of course, the all important students. Academic drift is something the Press and Editorial photography course at Falmouth resist strongly. I agree that the intellectualisation of photography is a problem, (not necessarily for certain academics unfortunately) and an alienation from audience…. which is virtually a crime as far as I am concerned. No opaque vocabulary here. David white, Senior lecturer, BA(Hons) Press and Editorial photography, Falmouth University.